Description - The male mallard duck has a greyish body, chestnut coloured breast and a green head with white neck rings. The inner feathers of the wings are a metallic purplish-blue, bordered in the front and back with white. The female mallard is a mottled brown with a white tail and the feathers of the inner wing are also purplish-blue. The bill is a mottled orange and brown. Distribution - The mallard duck breeds in the north and winters in the south, along coasts. They inhabit marshes, ponds and marshy lakes. 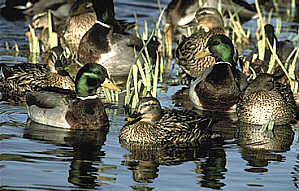 Biology - In midwinter mallards form pairs and migrate northward together heading for the female's place of origin. There they will build a down-lined nest to place the 8-10 light olive-green eggs. The male duck stays until incubation is well underway, then leaves to join a flock of other males. They often interbreed with domestic ducks, producing a variety of odd-looking hybrids. Mallard ducks are a normally shy creature but do occasionally become tame in city parks and on reservoirs.